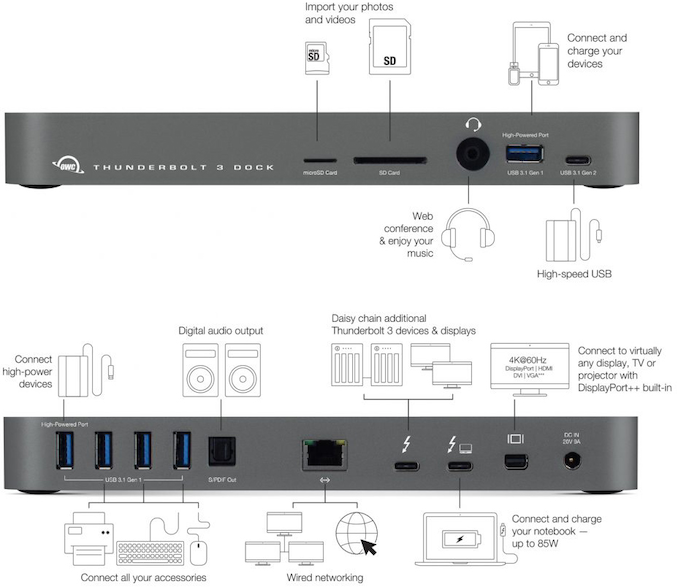 OWC this week introduced its new flagship Thunderbolt 3 dock, which features 14 ports. Living up to its flagship aspirations, the “one dock to rule them all” can also deliver 85 W of power, giving it enough power to drive a 15.6-inch laptop. When compared to a similar dock launched about a year ago, the new one loses a FireWire port, but gains a microSD slot along with a 10 Gbps USB 3.1 Gen 2 Type-C connector. Just like its predecessor, the new OWC Thunderbolt 3 14-in-1 dock is aimed at professionals who use laptops, yet also own a high-resolution display (or two) along with multiple peripherals. The key feature of docks with over a dozen of ports is to keep everything — monitors, a keyboard, audio equipment, GbE, external storage, professional devices, and so on — connected to one device. When the owner comes with their notebook, all they have to do is to plug a single cable to the PC. Without further ado, let us move on to what exactly the OWC Thunderbolt 3 14-in-1 dock offers. When it comes to common ports, the dock has five USB 3.1 Gen 1 Type-A connectors accompanied by one USB 3.1 Gen 2 Type-C port. Furthermore, the dock also has two Thunderbolt 3 ports (one for input) along with a miniDisplayPort 1.2, giving it the ability to drive two 4K monitors as well as a high-performance TB3 peripherals (storage, eGPU, etc.). Accompanying the mDP is a Gigabit Ethernet jack, which is quite popular in both consumer and business environments. Moving on to less common connectors (at least when it comes to docking stations). The device also has an SD card and a microSD card reader (unfortunately, supported speeds are unknown), one is aimed at professional photographers, another is designed for those who use various emerging devices like drones. Speaking of professionals, it is necessary to note that the Thunderbolt 3 14-in-1 dock also has an S/PDIF output, and an additional 3.5-mm audio in/out to connect speakers, mics, headsets, and other equipment. 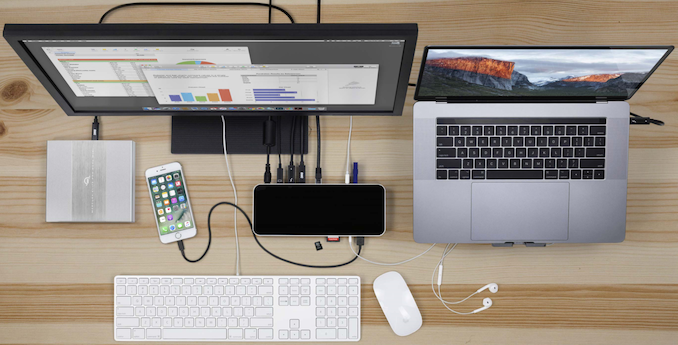 One important advantage of the OWC Thunderbolt 3 14-in-1 dock over its predecessor is its ability to deliver up to 85 W of power over a Thunderbolt 3 interface. By contrast, the model launched in 2017 only could deliver 60 W of power, which is enough for a 13.3-inch laptop (e.g., MacBook Pro 13.3), but clearly not sufficient for a 15.6-inch notebook (e.g., MacBook Pro 15.6). 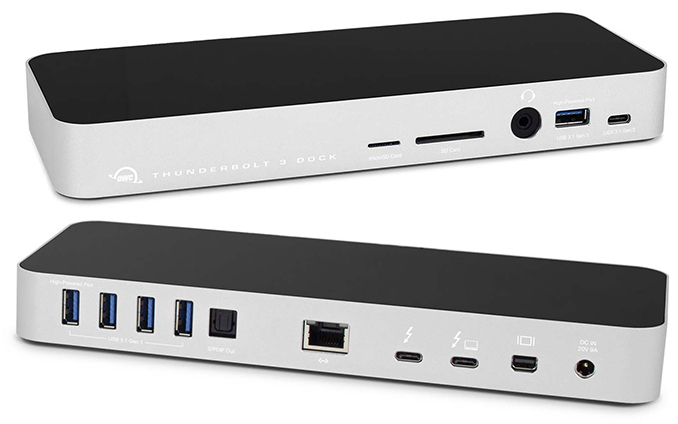 Considering the number of ports that the new 14-in-1 OWC Thunderbolt 3 dock has, it is evident that it has at least five controllers/bridges (USB 3.1 Gen 1, USB 3.1 Gen 2, GbE, audio, SD) along with power ICs, and other necessary chips inside. As a result, OWC's new flagship dock has a flagship price, hitting the shelves at $299.99. In the meantime, its predecessor with FireWire can now be acquired for $249.99. My Dell XPS technically needs 95W+ (came with 130W charger), but it works perfectly well with 65W dock. Under heavy load it slowly drains battery, but only once I came close to drain it (20% left) and that was pretty extreme day. So I dont consider 85W charger to be something negative.